Our Ports and Harbours team was responsible for the innovative design of the new dolphin at Jetty 1 to allow the berth to be used by larger, heavier 40,000T DWT vessels. This was in order to provide a commercial benefit to the client. 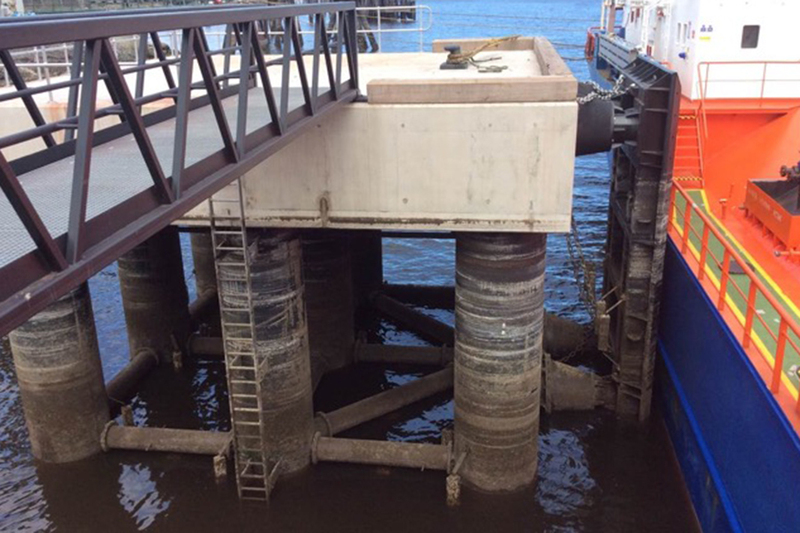 Due to the nature of the client’s facility a full close down of the jetty was required during the works. As a consequence, the contractor undertook the works on a continuous 24hr basis to reduce the programme. Fairhurst took the client’s brief to repair the damaged existing dolphins and to provide a new larger dolphin in order to allow the use of larger modern shipping. Fairhurst specified the concrete repair works to the existing dolphins and designed new fender piles, panels and fender unit elements. The new dolphin was designed as a berthing system to absorb the berthing forces from the specified shipping loads. The new dolphin was provided with a 60T mooring bollard. In order to ensure that the key constraint a of short and defined programme was met, Fairhurst designed the dolphin so that no raking piles or grouted ground anchors were required and that all works could be undertaken using standard land-based piling plant.